I have certainly thought about blogging about gardening during the past season but that’s as far as it got. Thinking about it. Don Marquis, an American poet and journalist said “procrastination is the art of keeping up with yesterday” . And while it didn’t happen yesterday, here’s the story of our experience with a brand new crop this year. Sweet potatoes. Our growing/hardiness zone is 4B in Ottawa, ON. We had talked about growing sweet potatoes in previous years before but had concluded we weren’t in the right zone. That changed when we learned that a local organic seed distributor sold sweet potato slips. They aren’t available until June here. You plant them only after the risk of frost had passed. Tilled and mounded a 10 foot row. Laid a wide strip of black plastic over the row (sweet potatoes like warm soil) and secured it at the edges . Make a slit in the plastic every 2 feet and plant a slip. That’s it till harvest. How easy is that! Water and sunshine throughout the growing season and the vines grew and spread until you could no longer see the plastic. We were all very interested to see what, if any harvest would await us when the time came. Harvesting must occur after the first frost when the vines turn black. Here’s where we started to wonder if sweet potatoes were all that darling or if they were just plain finicky. Digging sweet potatoes is not that easy. We learned they grow vertically and try to find their way to the other side of the world. Down into the clay they went (some of them were 18-20 inches long). They bruise and break easily when bringing them out of the ground. There was a bit of exasperation when we started and found we had to scratch around a great deal with hand trowels to see if the potatoes had traveled hither and yon. We got better at digging with the garden fork after a hill or two. If the soil isn’t nice and loose the potatoes break. There were cheers when we removed potatoes in tact. We harvested 30-35 pounds of sweet potatoes from 5 slips. Not bad. But the story doesn’t end there. Sweet potatoes need to be cured. I looked for advice on how to cure then and found there were as many ‘recipes’ as there were advisors. Basically the potatoes must be kept in a place that is very warm (25-29C) and humid (85-90%) for 3 days or 7 days or maybe 21 days. What?? One consistent message was curing must occur-conversion of sugars and making it so they will keep longer. Avoid scaring or bruising the potatoes lest they start to spoil. I layered the potatoes between sheets of newspaper and put them in 3 containers in our downstairs bathroom. I covered each container with a garbage bag (thinking it would help with humidity) and then a blanket/quilt. A little heater helped keep the temperature up, as did having the lights on day and night. Once in a while I would turn on the shower to up the humidity. Such finicky darlings, sweet potatoes. I checked them regularly. The humidity never got as high as recommended (had a little temp/humidity gauge in the room). After 3 weeks we reclaimed the bathroom, wrapped the tubers individually in newspaper, storing them in a cool dark place and now hoping to have sweet potatoes for the next several months. 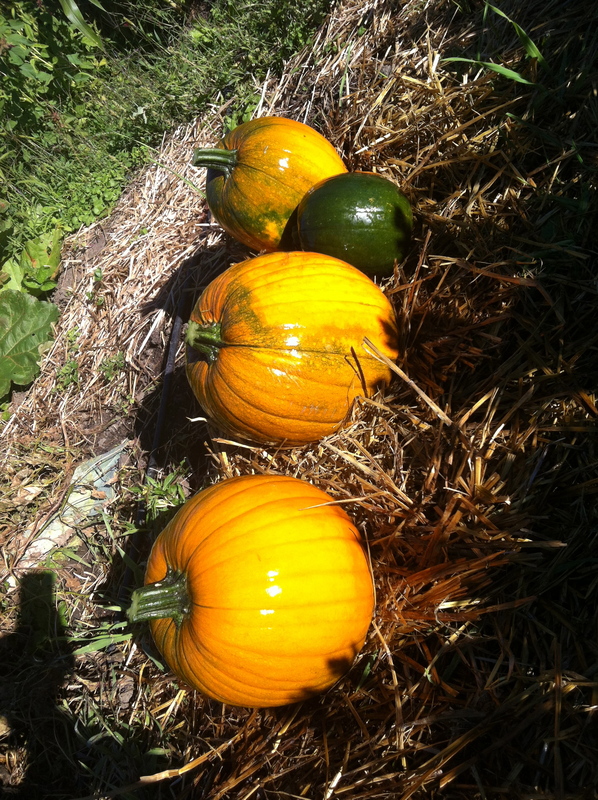 We haven’t decided if we will grow them again next year. By spring the effort of harvest and curing this fall will be mostly forgotten and we will be enthusiastically entertaining thoughts of garden bounty. Our first year was about discovery and learning the ropes. It had to be about something for it certainly wasn’t about garden bounty. The soil was hard, there was lots of clay and we spent hours weeding (unsuccessfully) as it was pretty much impossible to dig down to most roots. Year Two we decided to go big or go home. We invested in 9 cu. yds. 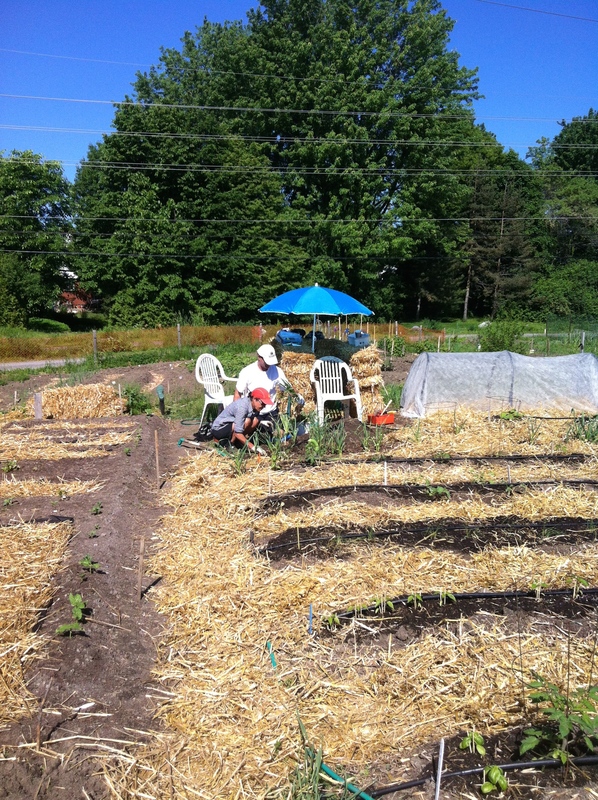 of mushroom compost, an irrigation system, uber row covers and more straw for mulch. The results were outstanding. Broccoli plants higher than your waist, tomato plants burdened with fruit and weeds that were much easier to remove. And bounty was an issue, a good issue at that. We are starting to get the hang of this, sort of. As with any garden, there were failures and successes. There was enough butternut squash to feed a small village, tomatoes by pail and the squash beetles continued to win in the end. As they had every year in the past. We are officially an expanding enterprise. We are now three partners tending the garden. 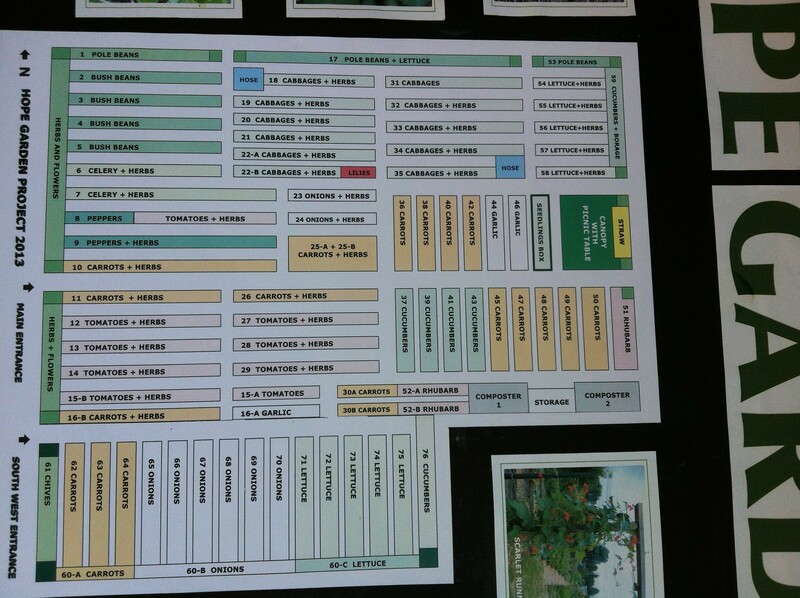 A few planning sessions to determine what we’ll grow and where it should be grown (plant rotation and all that). Everyone took on starting some plants from seeds. For the most part, we all had success. More mushroom compost was ordered and delivered in spite several false starts and an almost saga of a stuck dump truck. Introduced our friend and new gardening partner to the garden and the neighbours. Trying to grow leeks from scratch. Am thinking we may be lucky to have leeks that are the width of a pencil by harvest time. Trying other new things this year, such as horseradish, kale and arugula. Irrigation system up and running, straw mulch in place. Cut worms have murdered two pepper plants. Squash beetles are showing up already. No matter, it’s great to get out there with your friends or on your own. We convene with Mother Nature and if we’re lucky, we’ll have carrots, organic carrots, from our own effort and they will average about $10 a two pound bag! How is your garden growing? And do you have any advice about combating squash beetles? 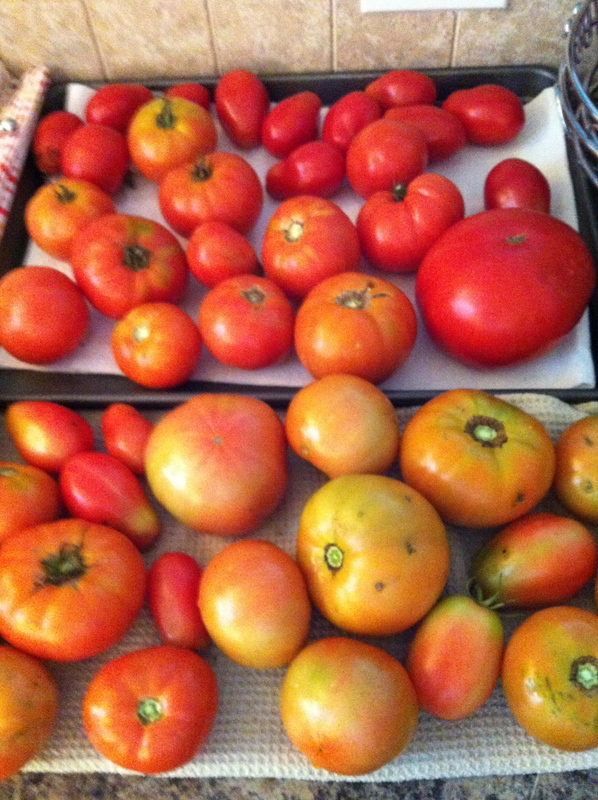 Yesterday was a perfect fall day to bring in most of the garden’s bounty. We will be getting frost warnings soon and I figure it’s just best to get going while the going is good. 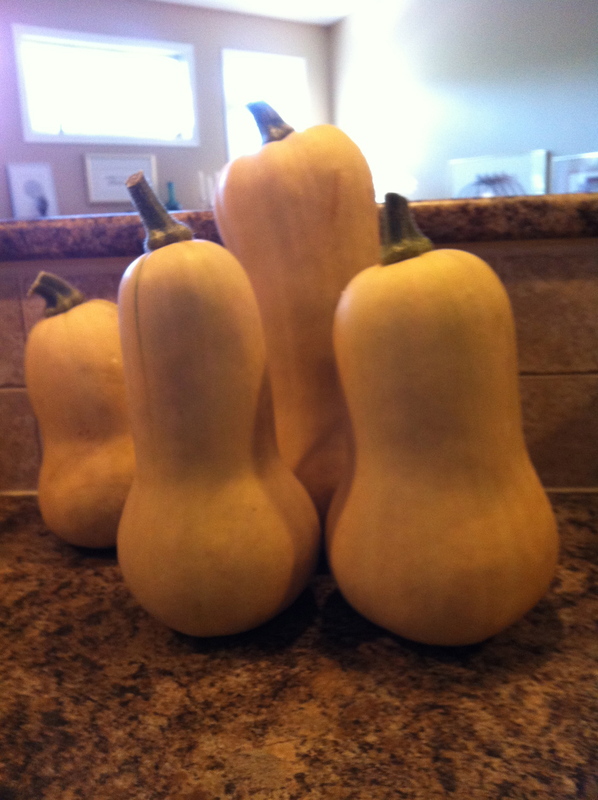 Got Any Recipes for Butternut Squash? The gardening season is winding down. It’s been a good one. 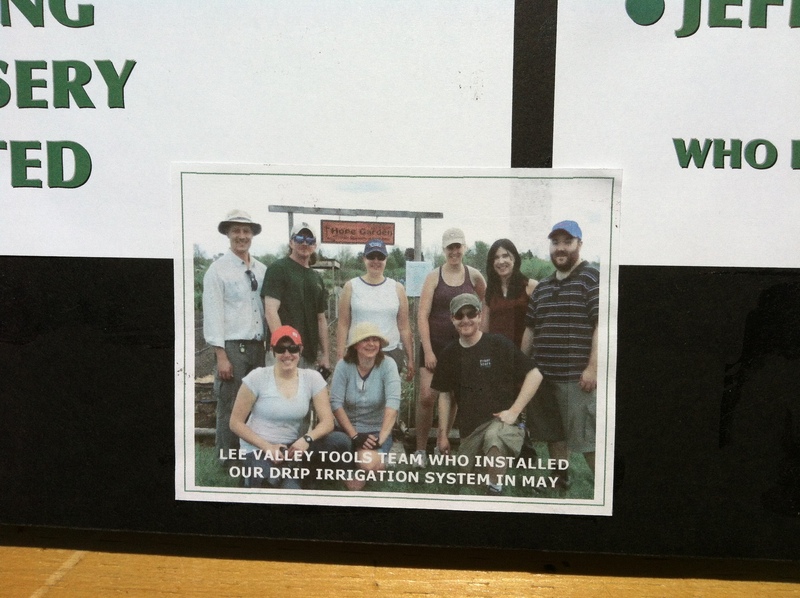 We worked well alongside Mother Nature. The pests and diseases, well we tried various things to keep them at bay and in the end all they had some success, but then again, so did we. We are working alongside Mother Nature for another growing season. She’s been mostly tolerant with us although she continues to let us know who has the upper hand. This past few years of active vegetable gardening has made me realize how much you need to know to grow a parsnip. Or a cabbage. Or a squash. To grow anything really. 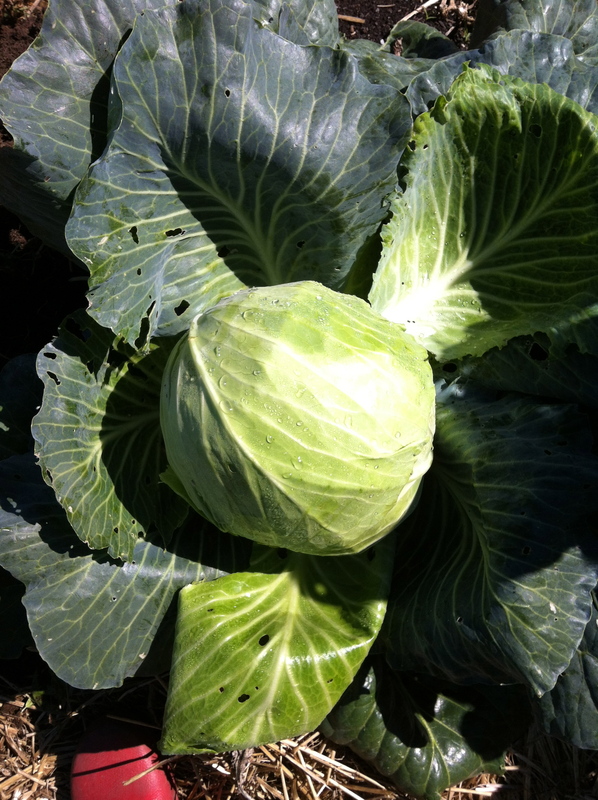 Here are some late August vegetable garden observations from the Ottawa valley. It might be seen as wisdom but that would mean I had knowledge and while I/we learn more every year, it’s a drop in the bucket of garden smarts. We have some particular ups and downs in our little plot. 1. Beans mature in 20 minutes. When you pick beans from the row or from the pole structures, you move along and pick all that are ready. When you turn around to walk back you see many more. They weren’t there before. Honestly. 2.Parsnips are not easy to grow. 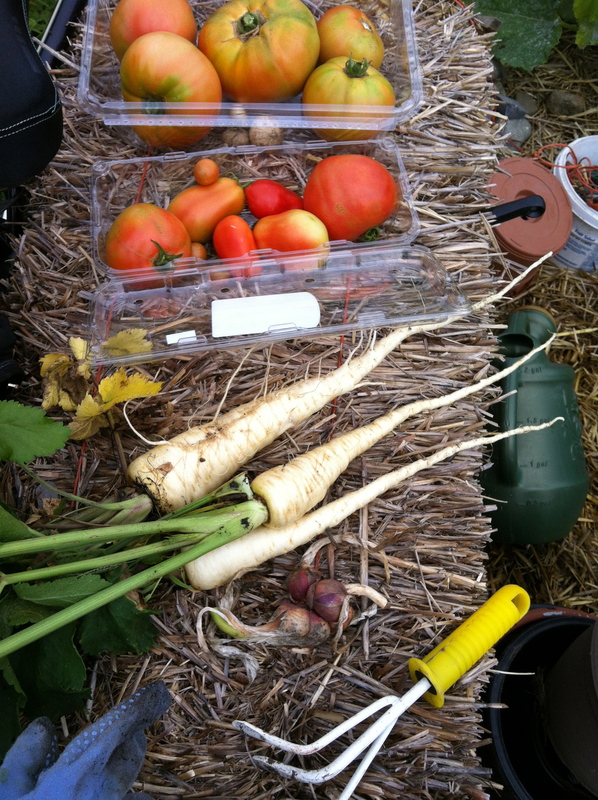 I blogged at one point about our efforts to grow parsnips last year. The package says parsnips take a long time to germinate. We knew that but found there were many “weeds” along the row and we pulled them up regularly. We learned, too late, the weeds were parsnips and so we had no parsnips last year. This year we tried again. Now we recognize their little tops (and know they don’t look like carrot tops). We sowed a row. We waited. Three parsnips came up. We re-seeded. None came up. While parsnips will be sweeter if you wait to harvest them after a frost, I decided we’d eat them when they were big and healthy. By the time they got sweeter another creature might have decided they were tasty. And we only had three. 3.A Day Can Make a Big Difference. Saturday: I visited the garden last Saturday. Mildew was showing up on the many squash plants, those ugly squash beetles that we had kept at bay were making a reappearance but overall the squash plants looked pretty good for this time of year. 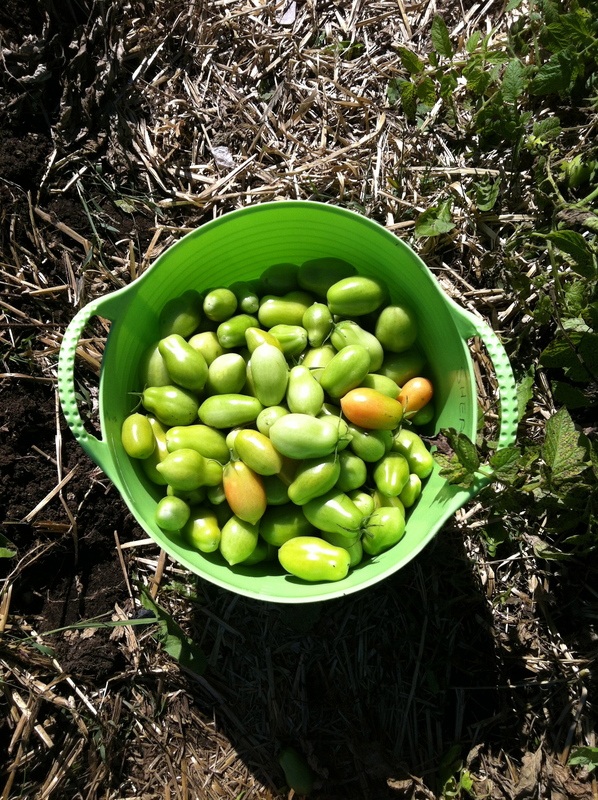 The tomato plants were burdened with tomatoes. So much so they were falling over. Should we have staked them differently or perhaps removed blossoms to make it so there wasn’t so much fruit? The leaves looked pretty healthy. Sunday: When I arrived I wondered if this was the same garden. Overnight it seemed the plants had receded from their fruit. 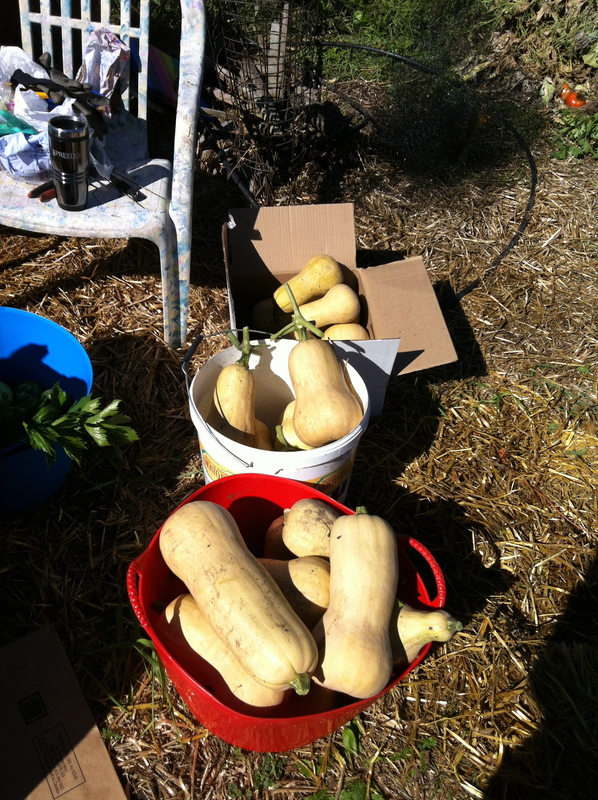 Squash plants looked shrivelled and beleaguered. Leaves on the tomatoes had spots on them and a number had started to curl and die. This process must have been under way the day before but it seemed to be such a big change. Anyone got any suggestions/advice? The fruit looks fine and there will be lots of both. I spoke to our neighbour Kahlil and asked him about a couple of other things in our garden. For example, our pepper plants are healthy but only now do we have a couple of blossoms on them. It is way too late. Kahlil said he has been gardening at his community plot for 32 years and his observation is that every year there are “two things that don’t work”. It’s a mystery, he says. One year green peppers are great and the next year the same variety of seeds will have disappointing results. We won’t be at the garden for 32 years. Perhaps Mother Nature is handing us more than two failures a year as she realizes our overall experience will be shorter than Kahlil’s and we need concentrated lessons. 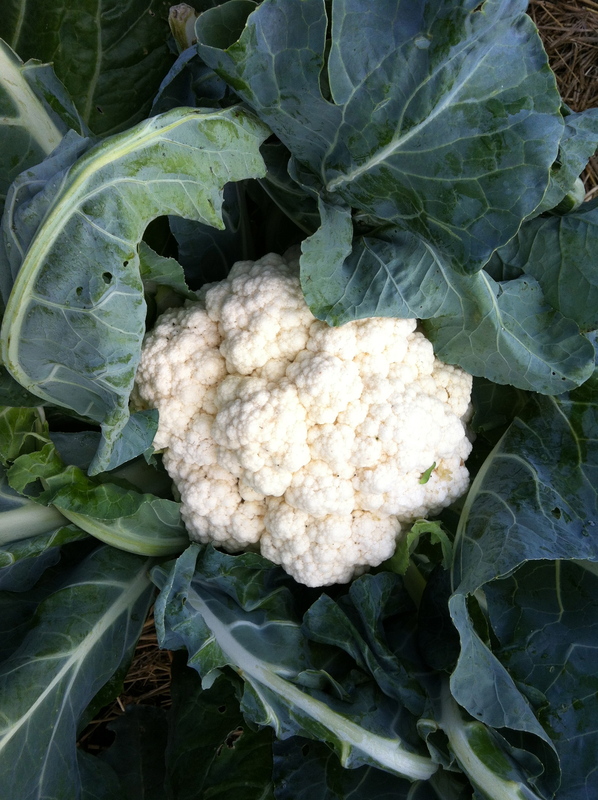 On the other hand we have harvested beautiful cauliflower and broccoli, cabbages and carrots and we will have tomatoes and huge butternut squash. It’s a pleasure to visit and work at the garden, ups and downs and all. In our community garden, someone wrote “grow your soul” on the billboard next to Hope Garden. The Shepherds of Good Hope is a mission “dedicated to compassion”. Located in downtown Ottawa, ON, the mission has several programs, one of them is the soup kitchen. And that is where the community garden plots come into the picture. 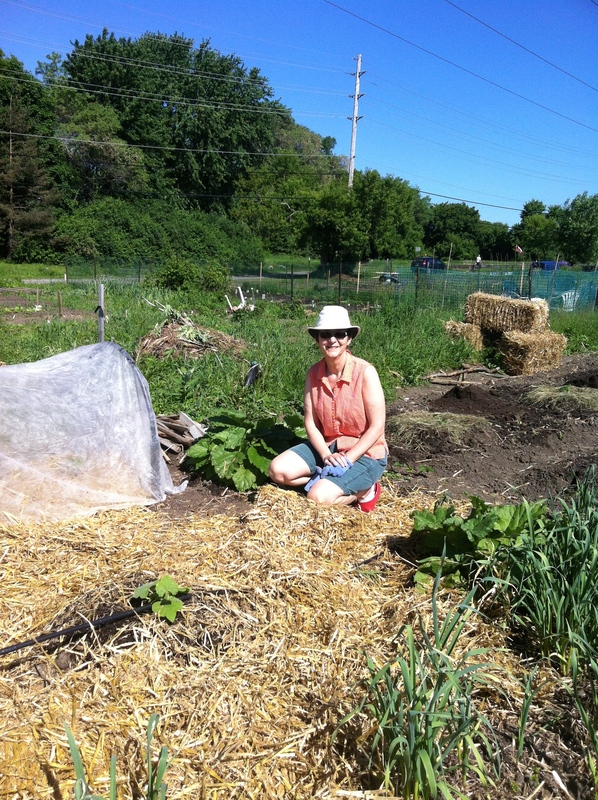 By way of the talent, commitment, time and generosity of volunteers and donors, some six plots of the community garden are known as “Hope Garden”. We learned about Hope Garden when we started to tend our single plot. Hope Garden is managed (extremely well) by volunteer Barbara Harris. It is a garden to emulate, if you can. 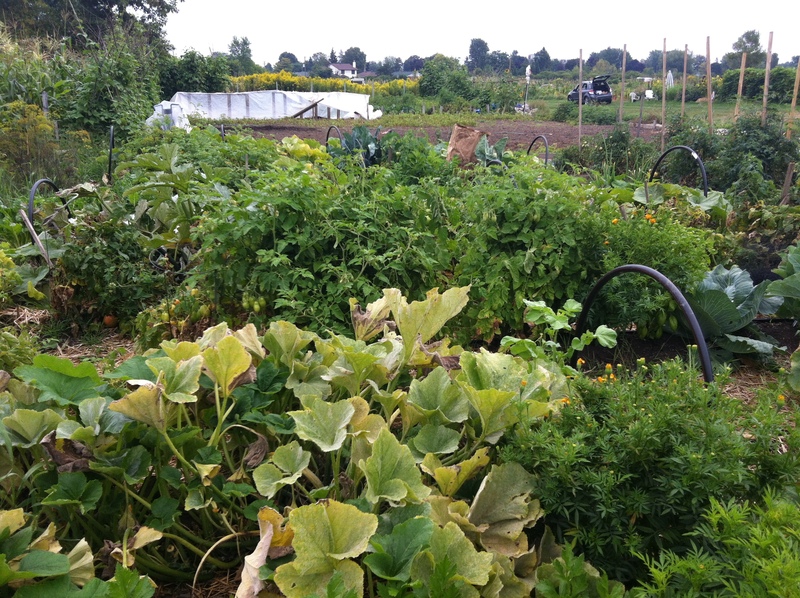 Things grow so well and look very healthy in their plots. 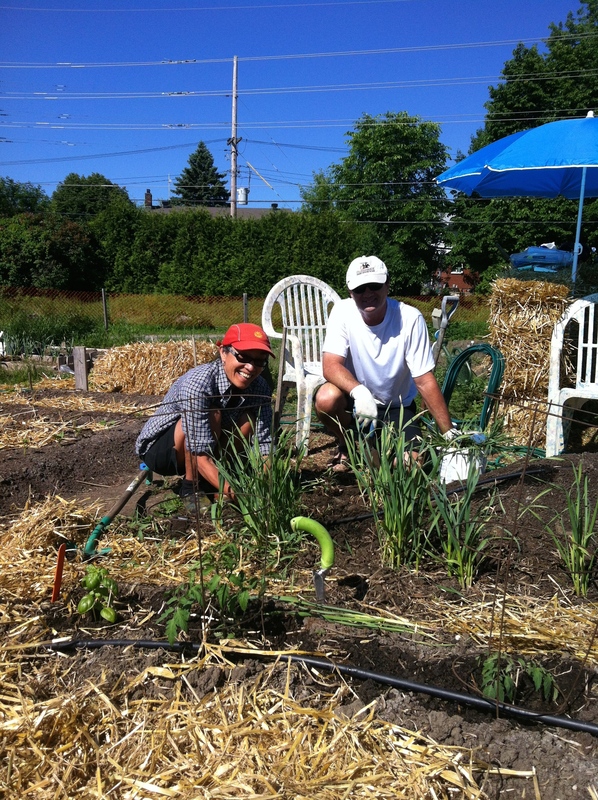 There was an article in the Ottawa Citizen newspaper recently about Hope Garden. This past weekend there as a garden party at Hope Garden. It was a beautiful day. You could stroll through the garden and see what they are growing this year. There was a quiz about plants, species, latin names. I left that one to others to complete. 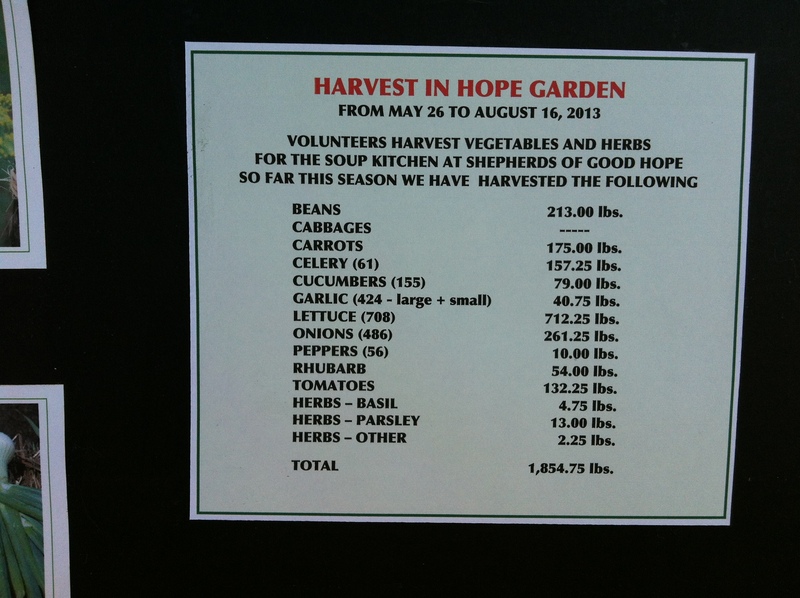 There are many volunteers at Hope Garden. Some are in charge of specific plants while some are “drop-ins”. 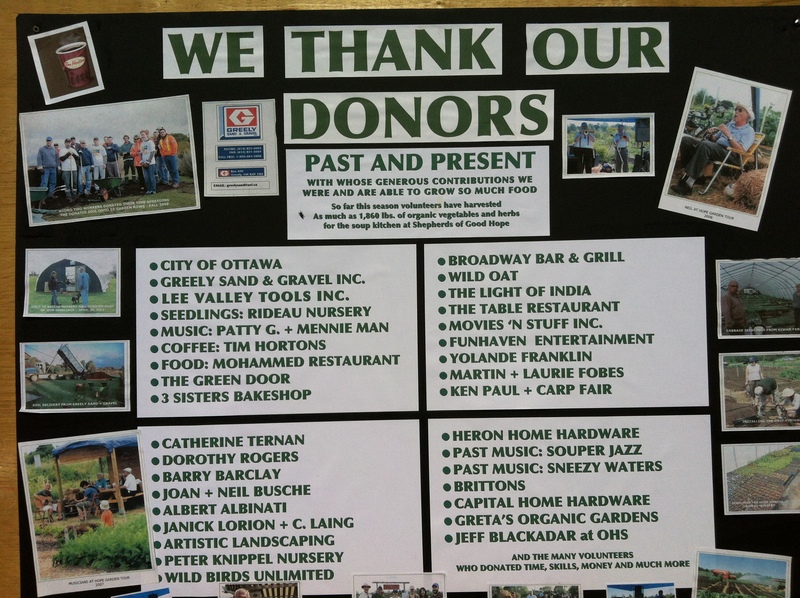 Many businesses donate goods and services. They keep meticulous records of what is harvested. You could enjoy food and beverages while walking around the garden. I went to the party but also spent time in our own garden plot listening to (well singing along with and maybe doing a little dancing) the music that carried across the gardens as I worked. Now that was a very pleasurable garden visit. But then again, aren’t they all. 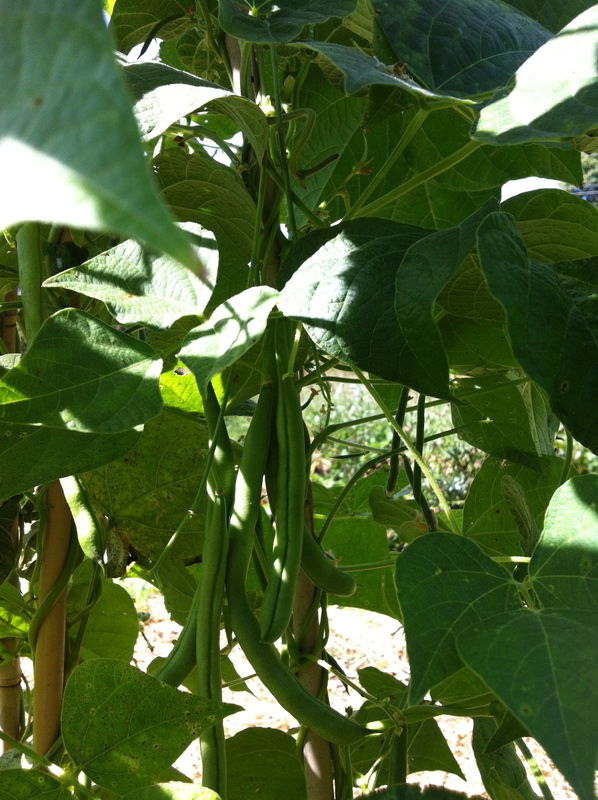 Growing beans, growing your soul and in the case of Hope Garden helping other souls. Do you find gardening good for your soul?